“Techorating” a kitchen is a great way to get some additional functionality out of one of the most important rooms in your home. Smart home technology is an essential addition for any kitchen. There are a number of devices coming online that makes “techorating” useful component in any new design. Techorating is updating or furnishing a home incorporating technology. The following are a few ways to make your life in the kitchen simpler and more manageable. 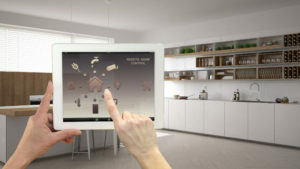 Can most likely integrate if the home has any smart door lock, automated lights, smart thermostats or other connected devices. You will have the ability to use voice control for music streaming, kitchen timers, reminders and even hands-free recipes. It is a great way to add convenience of technology to the kitchen. Can replace any existing knob on your stove. With this knob you can set cook times and burner settings, use voice commands, and access the stove remotely on a mobile device. Imagine having a pot of water on the stove to cook vegetables and your late getting home so you turn the burner on remotely saving time. This is all about scenes and moods that lighting can set through home automation. For example you can select a lighting configuration that is brighter for kitchen prep and cooking and with the same lights have another configuration that sets a lower light for an entertaining mood in the same space. You can achieve this in the kitchen by selecting a lighting brand or smart-home brand that offers a scene capability for lighting. For kitchen convenience and accessibility. Each manufacturer has their selections of motorized cabinets for kitchen convenience and accessibility. 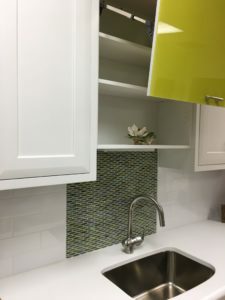 Wall cabinets can open with a touch of a button or lower to the countertop level to access their contents. These connect a doorbell to a smartphone, touch screen or any other mobile device. You are in the kitchen preparing a meal and the doorbell rings. With a built-in camera you can identify the guest and with a two-way intercom ask them to come in or come back later. Try one of these neat techorating ideas to transform your kitchen into a paradise.